It started with the discovery of a young woman's brutalized body in an old Charleston graveyard I've been hired to restore. The clues to the killer, and to his other victims, lie in the headstone symbolism that only I can interpret. Devlin needs my help, but his ghosts shadow his every move, feeding off his warmth, sustaining their presence with his energy. To warn him would be to invite them into my life. I've vowed to keep my distance, but the pull of his magnetism grows ever stronger even as the symbols lead me closer to the killer and to the gossamer veil that separates this world from the next. 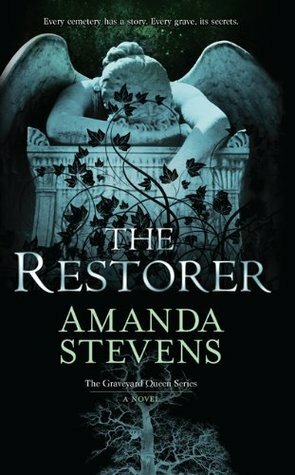 As much as I'm a weeny when it comes to anything that has to do with horror or ghosts or the like, I really enjoyed The Restorer. Of course, it wasn't really all that creepy or bone-chilling, but it was intriguing nonetheless. A woman who can see ghosts and choosing to live her life as a graveyard restorer is interesting (something to do with graveyards being hallowed ground, I think). A murder mystery that she gets roped into when she's got so much to worry about concerning the ghostly visitors she's surrounded by and the danger that they impose on her life... which end up bringing even more dangerous ghostly intrusions unto her somewhat controlled lifestyle. Even more intriguing is the history and lore that goes into a story like this. How much of it is true and how much of it is only part of this fictional world doesn't really matter to me in the least (maybe it should, but whatevs); it's always enticing to me when the elements are combined like this: a murder mystery, a ghost story, and tales of history and ghost lore to connect everything together. On top of that, mysterious characters to propel the story line into progression. What I liked mostly about this book would have to be that creepy vibe in connection with the ghostly appearances and the murder mystery. The atmosphere of this book is undoubtedly creepy amazing -- moody, dark... the likes. The only thing I'm not too overjoyed about would be the characters. Amelia is interesting enough as are some of the supporting characters, but to be honest, no one really stands out in much of a unique way. In fact, Devlin is stock-trade main male character with his broody, mysterious, dark past and tragedy with an intense past romance to top it off. It's a shame he's not more interesting, since I can sense that it would be nice if he weren't so standardized. I DO like the implications of his being haunted by his dead wife and daughter though--that he's the one who is having trouble letting go.